Tour Description: At Beijing airport be met by our private guide and driver. Take about 1 hour’s drive from Beijing Airport to Mutianyu Great Wall and hike on the wall as long as you can. Mutianyu Great Wall is one popular section of the Great Wall but less crowded than other sections, well-known for its beautiful surroundings-the dense woods and rich pastures changing colors with the seasons of the year. After the tour, transfer you back to airport. *Cable cars/toboggan at Great Wall. My 10 hour layover is overnight. I arrive at Beijing at 10:40 pm Saturday April 20th. My flight to my next destination is then at 9:20 am Sunday April 21st. Are there Great Wall tours available during an overnight like that? Or any other tours? Sorry, we do not have any tour available by then. According to your layover time, you will have plenty of time to visit the Great Wall. But tomorrow Saturday is Apr. 20, 2019. Please reconfirm your tour date. We just sent an email about the tour details to you, please check. We will be arriving at 10:55am from Philippines and departing for Washington at 18:25pm. Is there enough time to visit the Great Wall? Yes, you will have time to visit the Great Wall. We will send you an email about the tour details soon. Hello! I have an 8 hour layover in Beijing next week. My flight arrives at 04:50 and departs at 12:50. Will have enough time to do this tour? Than you for contacting us! We just sent an email about the tour details to you, please check. 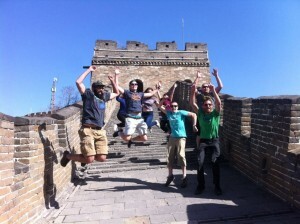 We took the tour to the Great Wall, and we are so glad we did! Our flight was delayed, but we were able to keep in contact with our guide through emails with the company. Lisa, our guide, was wonderful! She was friendly and informative. Our driver was very skilled. The Wall was amazing! So glad we were able to spend time at one of the wonders of the world instead of 9 hours sitting in the airport! Thank you for this amazing experience! Thank you so much for your feedbacks. Would you please take little time leave few words for us on TripAdvisor? 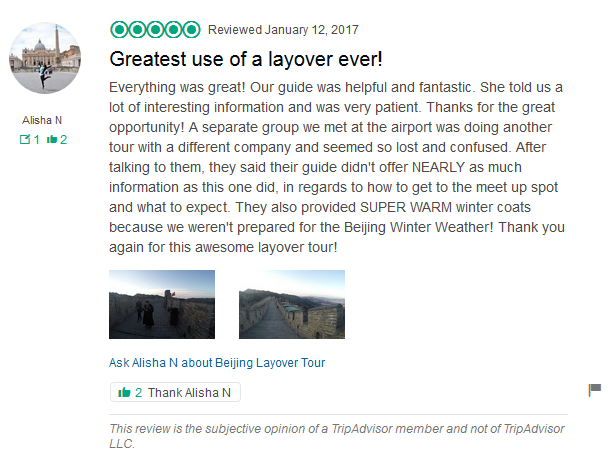 There is our page: https://www.tripadvisor.com/Attraction_Review-g294212-d10264740-Reviews-Beijing_Layover_Tour-Beijing.html. We will be very appreciated!! We will be arriving at 4:50am from US and departing for Thailand at 14:05pm. Is there enough time to visit the Great Wall?